The Rancher Express is the newest addition to our already popular stock trailer line-up. In 16’, 20’ and 24’ lengths the new Express Series is built with the same quality and standards people have come to expect from a Sundowner. Loaded with features such as heavy duty fenders, 4” I-beam cross members on 12” centers, slam latch gates, 2 side access doors and a 4” raised nose. The Express offers the features you want at a price everyone can afford. As always we stand behind our product with a 3 year hitch to bumper warranty and 8 year structural warranty. The Rancher Express is the newest addition to our already popular stock trailer line-up. In 24’ lengths the new Express Series is built with the same quality and standards people have come to expect from a Sundowner. Loaded with features such as heavy duty fenders, 4” I-beam cross members on 12” centers, slam latch gates, 2 side access doors and a 4” raised nose. The Express offers the features you want at a price everyone can afford. As always we stand behind our product with a 3 year hitch to bumper warranty and 8 year structural warranty. Sundowner Pro-Grade Toy Haulers are designed to transport you and your toys in style and comfort. 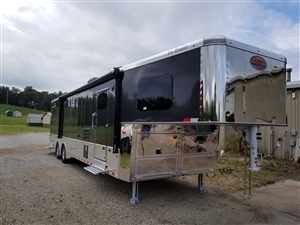 Whether you want to haul motorcycles, ATVs, snowmobiles or car Sundowner offers endless options to make your trailer uniquely yours. The all aluminum construction means easier towing and longer durability. You’ve invested a lot of time, effort and money into your hobby - when it comes to hauling don’t settle for anything but the best.